Car Draw 4 of 2018 - The Results! - Letterkenny Credit Union Ltd. Car Draw 4 of 2018 – The Results! Home > Car Draw, Credit Union News > Car Draw 4 of 2018 – The Results! Congratulations to our winner Denis McGrenra !! 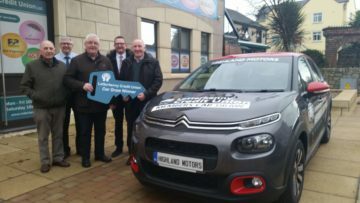 Pictured above (L-R): Ted McLaughlin, Gordon Randles, Mick Garry, Mark Carey (Highland Motors) and the lucky winner Denis McGrenra. We also gave away €27,000 worth of cash prizes! !